View of “Jacob Jessen: Things that reside,” 2014. In the work of the Danish artist Jacob Jessen, one often finds profound philosophical issues—such as a longing to encounter the limit of human awareness—condensed into elegant and well-designed objects. 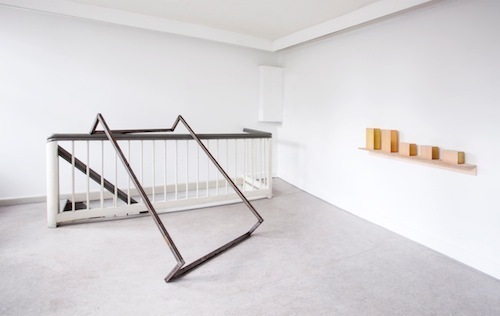 This is also the case in his latest solo exhibition, “Things that reside.” Upon entering the gallery, visitors are met by Weight of the World, 2014—three rusty iron rods on the floor. Jessen has stored these corroded objects, some of which he found, for over a decade, and they are here presented with tiny meteorites—which are 4.56 billion years old—thus bringing together two elements that have a surprisingly similar materiality. In one sculpture, a meteorite is placed on top of one of the iron poles. These minimal works offer us the raw dimension of the exhibition: Things simply existing here and now are paired while cosmological time collapses and is condensed. The show’s design dimension comes into view upstairs with Jessen’s “Lamps designed for residence in space,” 2014. Inspired by CubeSats, the lamps are cut from a single piece of aluminum. Inside each, a small LED light illuminates the box, but since it is hermetically sealed from all sides, the light is encapsulated, and we can only infer its existence. Five from the series are displayed in a row on a wooden shelf and underscore a primary tension in Jessen’s work: Though he wants the viewer to contemplate mind-blowing phenomena, at the same time his designs are so delicious to look at that one’s imagination stays at the level of appreciating the object itself.